As a career-long educator, I’m convinced that life-affirming and life-enhancing education holds the motivational key for world citizens to create a sustainable existence on Earth—for all flora and fauna. 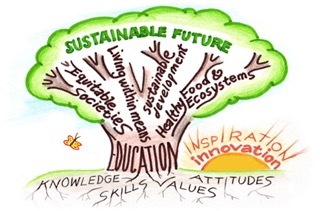 This belief undergirds the 2014 founding of “Sustainability Education Forum”. The term “forum” represents the original intent of the five citizens who co-founded the precursor, “Insight Forum”, the intent of which was to explore together relevant sustainability topics and issues. The origin of this newsletter was to serve as a means of communicating with members of Citizens of Sustainability in St. Anthony Village, MN (est. January 2013), and by 2015 it had morphed into the SEF News-Views Digest. The e-mail list eventually grew to include citizens located in the Twin Cities Metro region, in addition to a smaller group of national and international subscribers. This new, innovative course—Think Resilience – Preparing For The Rest Of The 21st Century— consists of 22 short video lectures (4 hours total), compiled and narrated by Heinberg. And most conveniently, it can be undertaken at one’s own leisure. So, one answer to “What can I do?” is simple enough, First, learn as much as possible about the challenging conditions that generate a need for developing greater resilience and sustainability. Second, seek recommendations for making plans and taking constructive steps—as soon as possible. No one can predict when calamitous conditions might occur; but, according to the ongoing warnings issued by knowledgeable experts, the possibility and probability of environmental and socio-economic problems are increasing. If your interest in this course is piqued, please watch the brief introductory first chapter, with Heinberg explaining the intent and extent of the program. Perhaps you’ll even be inspired to share this information with others open to learning more about achieving sustainable resilience. Even better, how about forming a study group to read and discuss one chapter weekly, perhaps in conjunction with occasional meetings and/or a shared website for posting comments? For a very modest $20 fee, this course is a supreme bargain. > Resource Insights: The Trouble With Infrastructure (Kurt Cobb). The trouble with infrastructure is that it breaks down and needs to be repaired, it wears out and needs to be replaced, and it gets destroyed and needs to be rebuilt. All that requires energy, resources, labor and money. Conceptually, the bigger we make any part of our infrastructure—roads, pipelines, electricity grids, water and sewer systems—the more expensive it becomes just to keep it in operating order. The same is true for our industrial plant, transportation system, commercial buildings and private homes. Things fall apart over time; entropy makes sure of that. To keep things from degrading to the point where they cannot function requires resources, labor and money—all of which cannot be spent on new infrastructure or productive investment, that is, all of which must go to maintain what we have rather than grow the economy. It is the lack of capital needed to grow which produces the limits referred to in Limits to Growth. It will cost so much to maintain our continually bloating infrastructure, including extracting the natural resources needed to fight the effects of pollution and climate change that we won’t have anything left over for investment. When that happens, growth stops. Eventually, the economy shrinks as poorly maintained infrastructure become less productive. This is a collapse, but perhaps not a rapid one. > Resilience: When Trucks Stop Running: Energy And The Future Of Transportation: Review (Allan Stromfeldt Christensen). In systems-analyst Alice J. Friedemann’s book, the underlying question becomes: How can the trucking system be adapted to run on alternative fuels in order to remain viable in a world of depleting fossil fuels, on which trucks rely? Because, if the trucking system can’t be adapted, then there wouldn’t be much reason for building out the large-scale windmill, solar photovoltaic, and all the other fandangle electricity generating ideas being hyped. Major concerns involve lifetime viability of existing diesel engines, lack of alternative comparable engines, problems using alternative fuels, like ethanol and bio-diesel, and notable deficiencies adapting battery-power and hydrogen-power. In other words, using energy to subsidize energy probably isn’t much of a viable long-term plan, but it can certainly score you the starring role as the latest messiah in this age of optimism being valued over facts. > The Real News Network: The US Middle Class Is Shrinking And Moving Towards A “Dual Economy” (Gregory Wilpert, Interview with Peter Temin, author of The Vanishing Middle Class). The Pew Research Center recently released a new study on the size of the middle class in the U.S. and in ten European countries. The study found that the middle class shrank significantly in the U.S. in the last two decades from 1991 to 2010, far more than anywhere else. Meanwhile, another study also released last week, and published in the journal Science, shows that class mobility in the U.S. declined dramatically in the 1980s, relative to the generation before that. Finally, a book released last March by MIT economist Peter Temin argues that the U.S. is increasingly becoming what economists call a dual economy; that is, where one part of the population lives in an economy that is prosperous and secure, while the other population lives in an economy that resembles those of some third world countries. > Resilience: Three Paths (Erik Linberg). The two existing dysfunctional, dead-end paths are: 1) the arc of history bends towards progress, the liberal view that, on the one hand acknowledges the link between economic growth or growing overall prosperity, and on the other a tolerant and cosmopolitan global order; and 2) power realism, a “me-first” view now harnessed by belligerent nationalists, with an attitude of economic competition that is likely to accept wide-scale inequality, and a winner-take-all competition over the world’s remaining resources. Both Liberals and Power Realists equally see the dead-end of the opposing path, but are equally blind to their own path. The third way clearly sees the dead ends of the other two paths, and is supported by math, science, hardheaded economic analysis, and even most religions. This path accepts that a secure and stable global order must be a relatively egalitarian one that will require a worldwide adoption of simple, voluntary-simplicity lifestyles. > The Age of Transition: Cultural Evolution In The Anthropocene (Joe Brewer). Where humanity is going there are no roadmaps. Here are some things unknown to our species in the three million years we’ve existed as “tool using” hominids [pre-modern era]: 1) emergence of a globalized economic system; 2) extraction and consumption of fossil fuels; 3) explosive population growth; 4) crossing of critical planetary boundaries; 5) a new pace and scale of complexity; and 6) entering a new geologic era (Anthropocene). We cannot simply apply the tools and models of past eras to the present situation. Nor can we employ them to forecast our possible futures. Instead we must gather the vast collective knowledge gained across the universities and research centers of the world to build newer, more complex models that make sense of our present and emerging realities. Cultural evolution is THE MOST IMPORTANT body of science for dealing with the global crises arising from this unprecedented time in human history. > Peak Prosperity: The Way To Save Ourselves (Chris Martenson). It’s time to be blunt: Humans are headed towards disaster. Most of us already know this, some consciously, others unconsciously. The data is obvious and the logic is clear. We cannot continue as we have been. The system is simply unsustainable. A (very) little bit of study reveals that exponential growth on a finite planet is a bad idea, which means that perpetual exponential growth is an even worse idea, insanity defined practically. But it turns out that debt-based money coupled to the insatiable human desire for more and more [stuff] is a very toxic combo. As it stands today, humanity’s [metaphorical] canoe is destined to speed right over the edge—unless we consciously do something about it, which we could, if we really wanted to. To save ourselves from ourselves, we have to begin doing things very, very differently. To start living differently, we need to start thinking differently. > Resilience: Strategic Thinking In A Time Of Change (Luis Gonzales Reyes). We’re experiencing the first stages of a major change in civilization. Two basic characteristics are a reduction of energy and available materials, which will mean greater social simplification (fewer people, interconnections and social specialization). Also, we will experience the collapse of global capitalism, a rise in conflicts over control of resources, a strong reconfiguration of the state and a decline in its capacity to act, a substantial loss of information, a demographic decline or an exodus to the countryside, and a strong commitment to food production within cities. Moreover, this collapse will change the social priorities that have been in place since the Industrial Revolution, in turn providing unprecedented opportunities for more just, equal and, inevitably, sustainable societies. There are four challenges: 1) move towards renewable energy sources; 2) move from an extraction economy to one that relies on production; 3) prevent activation of climate change feedback loops; and 4) stop the loss of biodiversity and damage to ecosystems. > Peak Prosperity: Keynesiasm VS The Real World (Charles Hugh Smith). In sum: nothing has worked as the Keynesians expected. Instead, state/central bank measures that were supposed to be temporary are now permanent, and the expansion of private-sector debt has failed to “trickle down” to earnings. The Keynesian solution—borrowing from future earnings to “bring consumption forward”—has expanded consumption at the cost of enormous increases in debt throughout the economy, which has exacerbated income-wealth inequality and declining real incomes. Can we finally admit that eight years of following the Keynesian coloring-book plan have not just failed, but failed spectacularly, and not just failed spectacularly, but made the economy even more vulnerable and fragile, as more and more future income must be devoted to service the skyrocketing debts? Isn’t it obvious that there are deeply structural problems in the economy that inflating yet another cred/asset bubble won’t fix? > Think Progress: Soon, The Only Glacier In Montana’s Glacier National Park Will Be In The Park’s Name (Joe Romm). A century ago, the Park had about 150 glaciers. By 1966, that was down to 37. The US Geological Survey reported Wednesday that only 26 remain, with some losing as much as 85 percent of their area over the past five decades. “It’s inevitable that we will lose them all over the next few decades,” said Dr. Daniel Fagre, who led the research for USGS. The American West has been warming twice as fast as the world as a whole for several decades, and Glacier National Park (GNP) has seen a tripling of 90°F days over the last century. As a result, the one million-acre park that borders Canada has lost more than four fifths of its original glaciers. > New York Times: Miles Of Ice Collapsing Into The Sea (Antarctic Dispatches: 3-Part Series). The risk is clear: Antarctica’s collapse has the potential to inundate coastal cities across the globe. If that ice sheet were to disintegrate, it could raise the level of the sea by more than 160 feet—a potential apocalypse, depending on exactly how fast it happened. Recent research suggests that if society burns all the fossil fuels known to exist, the collapse of the ice sheet will become inevitable. The reportedly biblical flood was likely a result of melting glacial ice at the end of the Ice Age, around 12,000 years ago. The remaining ice is locked in the poles of Antarctica and the Artic. In a worst-case scenario, climate scientists suspect that sea level could rise by six feet by the end of this century, and the pace could pick up drastically in the 22nd century. These experts have started to think that West Antarctica, as a fragile holdover, is basically a disaster waiting to happen—and that if human-caused global warming has not already set the calamity in motion, it may soon do so. > Valley News: America Gets Richer, But Not Its Workers (Max Ehrenfreund). On average, workers born in 1942 earned as much or more over their careers than workers born in any year since, according to new research—and workers on the job today shouldn’t expect to catch up with their predecessors in their remaining years of employment. Stagnant or falling earnings have put a squeeze on working- and middle-class households. The trend has also widened the gap between the rich and everyone else as, overall, the economy has continued to grow; but the bulk of those gains have ended up in the pockets of the affluent. These are some of the conclusions from a new working paper by a group of economists investigating the reasons for the decline of the American middle class. It remains to be seen whether the situation will improve in the future for younger workers today, but their prospects seem dim. Young workers’ incomes are still declining today, suggesting that their trajectories over the rest of their careers will be lower as well. > Green Tech Media: US Residential Solar Capacity Down 17% Year-Over-Year For Q1 (Julia Pyper). New data shows the home solar market contracted significantly in the first quarter 2017, led by a lull in California, with a contraction rate of 22%. Overall, residential solar capacity additions in the U.S. declined 11 percent from the fourth quarter of 2016 to the first quarter of 2017. Year-over-year, new residential solar capacity dropped by 17% nationwide, which is significant. Some causes include: 1) an above-normal winter rainfall season, especially in California: 2) a shift in marketing strategies, from door-to-door sales to retail stores, more focusing on profit and less on rapid growth, and moving into more lucrative markets; and 3) the lowest fruit (interested customer base) has been saturated. There are bright spots, where solar will flourish, but the overall forecast suggests either a flat or limited-growth outlook. > The Guardian: Conservationists Plan Expedition To Secret ‘Noah’s Ark’ In Sumatra (Jeremy Hance). Indonesia Sumatra has changed remarkably in the last few decades, from an island of villages and wilderness to one of vast monoculture plantations of pulp and paper and palm oil. Since 1985 the island has lost more than half its lowland forest, and it continues to have one of the highest deforestation rates on the planet. Its large mammals—many of which are found nowhere else in the world—have undergone a severe contraction, leaving them at risk of total extinction. Hadabaun Hills is the sole creation of Indonesian conservationist Haray Sam Munthe. Last year an independent group of local and international conservationists, led by Munthe and Greg McCann of Habitat ID, used camera traps to confirm rare species, like Sumatran tigers, Malayan tapirs, and Sumatran orangutans. McCann calls it a Noah’s Ark for endangered and critically endangered species amidst an ocean of palm oil plantations. > LA Times: Another Way Humans Are Polluting The Environment: Too Much Noise (Sean Greene). Natural sounds are an integral, yet often overlooked, part of the way we experience national parks and other public lands. But human activities—such as roads, development, and mining and logging operations—are drowning out this soundscape in almost two-thirds of protected areas in the U.S., according to a new study published in Science. In 21% of protected areas, human activity has cranked up the background noise so much that it’s 10 times louder than what the scientists estimated to be “natural” conditions. The din of road and jet traffic above these levels isn’t just an annoyance. Anthropogenic noise stresses wildlife and, in some cases, alters their behavior. Noise pollution can affect wildlife in a number of ways. Many predators rely on their sense of hearing to hunt their prey, and too much background noise could mask—or even drown out—subtle sounds. The good news is that compared with other ecological issues, noise pollution is a relatively easy problem to tackle. > Growing Culture: Parts Of A Whole: Mapping A Global Agriculture (Dan Hughes). The ways in which we produce our food and fiber has created many unintended environmental and social degradations. The predominant farming method perpetuated by industrial agriculture is monoculture, the cultivation of a single crop throughout a field or farm. We believe the future of agriculture should take the form of a hybrid that blends the advances of modern science with the traditional agricultural knowledge that is present within every community of producers, especially smallholder farmers of the world who have a tremendous amount of expertise from generations of innovation and adaptation. Our mission is to advance a culture of farmer autonomy and agroecological innovation, a whole-system approach to agricultural production that melds the gravity of cultural and social impacts within a productive model of environmental sustainability. Agroecology produces healthy food and helps protect the environment. > Resilience: Why Greenhouse Gas Emissions Did Not Really Stabilize In The Past Few Years (Roger Boyd). Other than carbon dioxide, the most important greenhouse gases are methane (CH4) and nitrous oxide (N2O). Methane has about 84 times the climate warming effect that CO2 does in the first twenty years. The biggest drivers of anthropogenic methane are agriculture (especially cattle and water-logged fields of rice) and leaks from natural gas (mostly methane) production and distribution. Many potential solutions have proposed and tried, but most are too complicated. A much simpler solution would be to measure the actual levels of greenhouse gases in the atmosphere, and set a global carbon tax based on their levels of increase/decrease—on a CO2 equivalent basis. Given that CO2 equivalent levels of GHG’s are increasing at an alarming rate of 3-4ppm per year, a very high carbon tax would be required. To support our complex civilizations, humans would have to deal with some incredibly tough decisions in reducing atmospheric GHG emissions to survivable levels. > Inequality: States V. Congress On CEO Pay (Sarah Anderson). Josh Elliott is fed up with overpaid CEOs. As the owner of a suburban Connecticut natural foods market with 40 employees, he says he could never justify pocketing hundreds of times more pay than his employees. Skyrocketing CEO pay and inequality last year motivated this 32-year-old businessman to launch a successful bid for a seat in the Connecticut General Assembly. Since taking office, Rep. Elliott has co-sponsored several bills aimed at narrowing our economic divide, including two that directly address the CEO pay problem. Legislators in Illinois, Minnesota, Massachusetts, Rhode Island, and San Francisco are also considering CEO pay tax proposals. While efforts to narrow CEO-worker pay gaps are spreading around the country, Republicans in Washington are working to undercut them. > Shareable: 3 Things We Learned About The Sustainability Movement At Future Earth (Neal Gorenflo). A recent three-day workshop was held by Future Earth’s Systems of Sustainable Consumption and Production (SSCP) knowledge action network at the National Socio-Environmental Synthesis Center (SESYNC) in Annapolis, Maryland. The top three lessons gained from an intellectually-rich workshop are: 1) the social sciences don’t matter much in the sustainability world, as much as the predominating hard sciences; 2) social sciences play a big role in cities, because our choices are shaped from a broad institutional context that includes behavioral, social, economic, and political factors (technical solutions all too often treat symptoms, e.g. carbon emissions, rather than focusing on causes, i.e. us); and 3) we might as well transition to sustainable means because the consumption party is ending. A paper at the workshop revealed a consensus among long-term forecasters that economic growth is going to stagnate if not decline in the 21st century. > Yes! Magazine: To Regain People’s Trust, The Democratic Party Must Support Single Payer (Sarah van Gelder). Beginning when Hillary Clinton led efforts at health care reform under Bill Clinton’s administration, the Democratic Party has prioritized the interests of for-profit health insurance companies over universal and affordable health care. Single-payer health care—or Medicare for All—is not extreme. It’s the law of the land in most of the “developed” world. And yet the corporate media won’t cover it. Nonetheless, 58 percent of Americans support Medicare for All, including 41 percent of Republicans, according to Gallup poll numbers. The Democratic Party needs to find its soul and its backbone. A political party that rejects pro-corporate policies that impoverish our country, that fights for health care for all, that puts people first—that’s a party that could electrify the nation and take back our country in 2018 and beyond. > Star Tribune: Lakes With Zebra Mussels Are Goners. Lock The Trouble There (Jim Davidson). New invasive species continue to arrive in Wisconsin and Minnesota—largely from the Great Lakes—on a weekly basis. Altogether, 180 invasive aquatic species are identified in the Great Lakes, according to the National Oceanic and Atmospheric Administration. For economic reasons, our elected officials encouraged international freighters to enter our fresh waters from the Atlantic via the St. Lawrence Seaway. Approximately 2,000 of 25,000 lakes in Minnesota and Wisconsin already harbor “aquatic invasive species,” according to state reports. Proposed solutions include closing all boat landings on lakes with known invasive species as a necessary first step, placing decontamination facilities and personnel at these boat landings, and requiring lake visitors to rent boats that remain in their respective lakes. We need to remember our ancestors wise and conservative council: be more compassionate, less divisive, less focused on consumption, better stewards of our children’s future and God’s good Earth. > Great Transition: How To Kick The Growth Addiction (Tim Jackson). Can we imagine an economy in which enterprise provides outputs that enable people to flourish without destroying ecosystems; where work offers respect, motivation, and fulfillment to all; where investment is prudential in terms of securing long-term prosperity for all humanity; and where systems of borrowing, lending, and creating money are firmly rooted in long-term social value creation rather than in trading and speculation? Two pillars have been present in my responses to the environmental crisis for more than two decades, namely: 1) enterprise as service; and 2) the concept of green or clean investment. The core concept is that finance capital must be a servant to a higher purpose than maximizing returns on investment. Rooted in indigenous beliefs, the concept of “Buen Vivir” promotes a way of living based on a mutually respectful, interdependent coexistence between humans and nature. > Resilience: Harvesting the Sun (Matt Dunwall). Over the last month we have been working on the first video [7 minutes] translated to English from Columbian farmer and scientist Jairo Restrepo, a world expert in Biofertilizers and soil regeneration. Aptly titled Harvesting the Sun, Jairo talks about the wonders of cow manure, soil microbes, trace elements, and their link with increased soil, plant and human health. Jairo describes industrial agriculture as a ‘dishonest agriculture’ robbing us of our health and proposes an alternative productive approach harnessing the power of biological mineral ferments which will allow all of us to grow cheap organic food through enhanced photosynthesis—by Harvesting the Sun. > Climate Action Events: Northwest Metro Climate Action, May 25, June 7, 8, 21. Anoka Area Climate Action, June 8 (Ocean Acidification). See websites for details.